University of Delaware students excelled at the Undergraduate Research Symposium at the University of Maryland, Baltimore County, Oct. 30. Pictured are, front row, from left, Michael Brister, Sanjana Luther, Amy Chevalier, Erica Boetefuer, Suranjit Mukherjee, Tejal Naik, Robert Sheehan and Devan Turner, and, back row, from left, Navpreet Tung (Delaware State University), Soma Jobbagy, Chet Markwalter, Kristofer Dewberry, Timothy Gilpatrick and Matthew King. 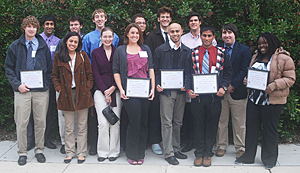 11:17 a.m., Nov. 8, 2010----Seven University of Delaware students, and one Delaware State University student who is doing research at UD, won top awards at the 13th annual Undergraduate Research Symposium in the Chemical and Biological Sciences at the University of Maryland, Baltimore County, on Oct. 30. Supported by the National Institutes of Health (NIH), the research conference was devoted entirely to contributions from undergraduates from universities and colleges across the Mid-Atlantic region. Students presented the results of their work in chemistry, biology and at the chemistry-biology interface in poster sessions. All entries were judged in groups of about 5-7 posters with the two top-rated entries in each disciplinary group receiving awards. Accompanying the UD students was Hal White, professor of chemistry and biochemistry and director of the UD Howard Hughes Medical Institute (HHMI) Undergraduate Science Education Program, which sponsored the students' travel to the event. Erica Boetefuer, “The role of ATG18 in signal transduction pathways during Drosophila development,” 2nd place, Biology Group 1L. Adviser Erica Selva. Michael Brister, “The structural characteristics of synthetically glycosylated Tau protein sequences,” 2nd place, Biochemistry Group 2P. Adviser Neal Zondlo. Amy Chevalier, “Trafficking patterns of adenosine A2A receptor,” Chemical Engineering. Adviser Anne Robinson. Kristofer Dewberry, “Determining the capacity of pulmonary cells to exit the lung during acute influenza virus infection,” Animal Science, for work at the University of Pennsylvania School of Medicine. Adviser Gudrun Debes. Timothy Gilpatrick, “Examining the binding properties of the enzyme LP-PLA2 and investigating its correlation with coronary heart disease,” Biochemistry. Adviser Brian Bahnson. Soma Jobbagy, “Characterization of next generation anti-androgens as potential prostate cancer therapeutics,” Biochemistry. Advisers Robert Sikes and John Koh. Matthew King, “Fibronectin appears in distinctive patterns in the lens of the eye,” 1st place, Biology Group 1K. Adviser Melinda Duncan. Sanjana Luther, “Comparing the immune response of C57BL6 and BALB/c mice infected with Vibrio cholera,” Biology. Adviser Michelle Parent. Chet Markwalter, “Elucidating mechanisms of heterologous neurokinin 2 receptor expression and trafficking in S. cerevisiae,” Chemical Engineering. Adviser Anne Robinson. Suranjit Mukherjee, “Synthesis of silver nanoparticles for use in an animal model,” 2nd place, Biology Group 1J. Adviser Anja Nohe. Tejal Naik, “Development of a peptide nucleic acid based siRNA delivery system,” 2nd place, Biochemistry Group 2N. Adviser Millicent Sullivan. Victoria Roop, “Characterization of the EMT response in CRYBB2PHILmutants,” 1st place, Biology Group 1I. Adviser Melinda Duncan. Robert Sheehan, “The effects of histone modification on lens fiber cell denucleation,” Biology. Adviser Melinda Duncan. Navpreet Tung (Delaware State University), “Complex interactions between bone stroma and prostate cancer cells is mediated through TGF-Beta signaling,” 1st place, Biology Group 2G. Adviser Robert Sikes. Devan Turner, “Vesicle formation through encapsulation of biologically-compatible ionic liquids,” 2nd place, Chemistry Group 2B, for work completed as an HHMI Exceptional Research Opportunities Program (EXROP) student with Isiah Warner at Louisiana State University. The HHMI Undergraduate Science Education Program at UD has several components, one of which is to strengthen undergraduate research in the biomedical sciences. Last summer, the program supported 25 UD students working in faculty laboratories in biology, chemistry, biochemistry, chemical engineering, mathematics and physical therapy. Earlier this year, UD was one of 50 research universities nationwide to receive a grant from the Howard Hughes Medical Institute (HHMI) for innovative programs to strengthen undergraduate and precollege science education. The four-year, $1.2 million grant, which began Sept. 1, is the fifth HHMI award that UD has won.